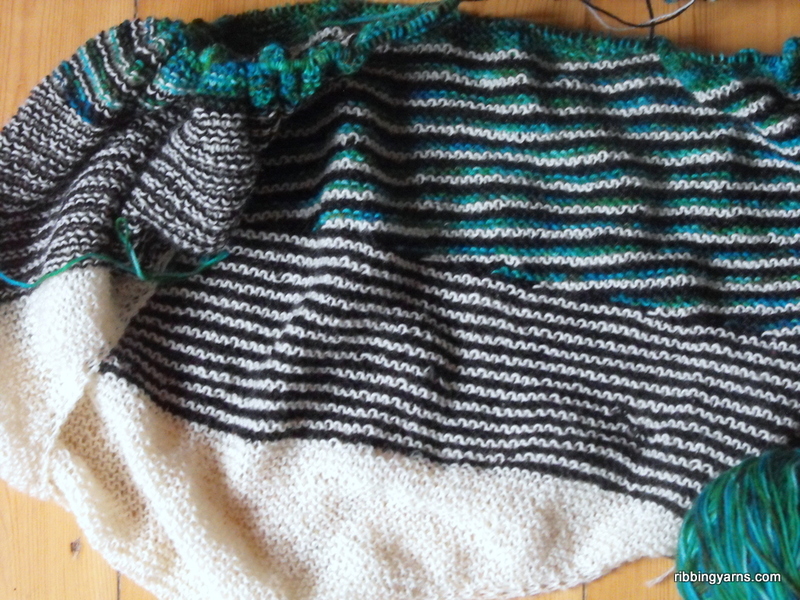 ← WIP Wednesday: Birdy Knits and Flights of Fancy! I’m joining you this week during a well-deserved sock knitting break for the 2nd round of Sock Madness 9! Yes, I got those Alohomora socks done, then we had a tense wait last week for the mods to organise the teams we will all be knitting in for future rounds (lots of “are we theerrre yet?” posts in the Ravelry group forums). I am now a proud member of Team Stranded. Woohoo! It seems like there are some lovely folk in the team with me- fellow Europeans as well as those Stateside and elsewhere, and it’s great for motivation when doing late night cables. The pattern for round 2 was sent out on Friday, and I have to admit, my heart kind of sank when I saw what was coming. 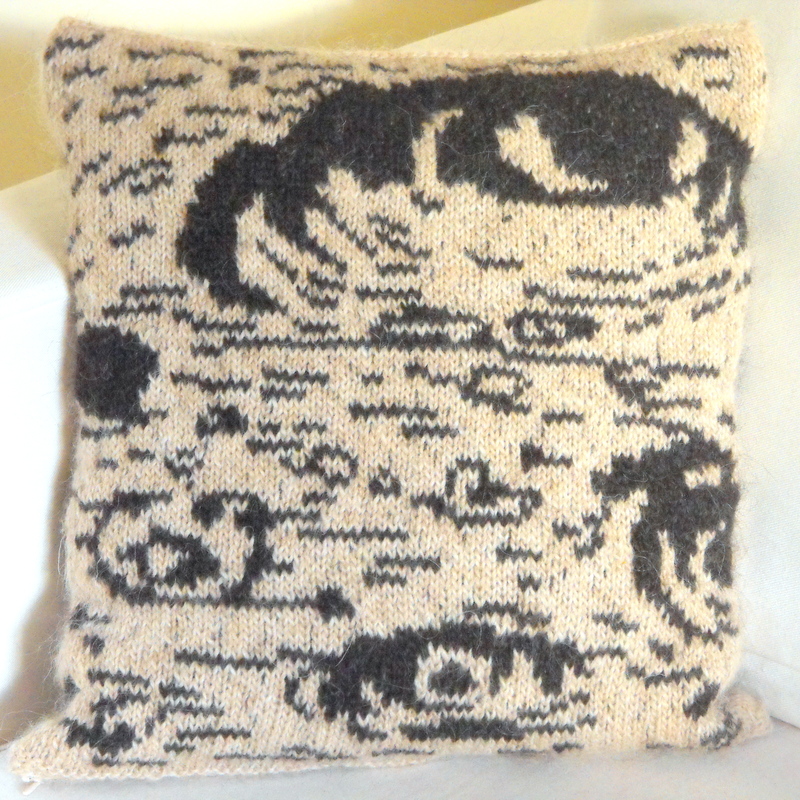 Not just cables- oh no!- but Cable Madness by Karen Buhr. The pattern is beautiful and I’ve always dreamed of some pretty cabled socks in my sock drawer, but the thought of knitting so many of them on tiny needles seemed beyond me. As you can probably tell from the photo above though, these socks are getting knitted, and I’m nearly there! 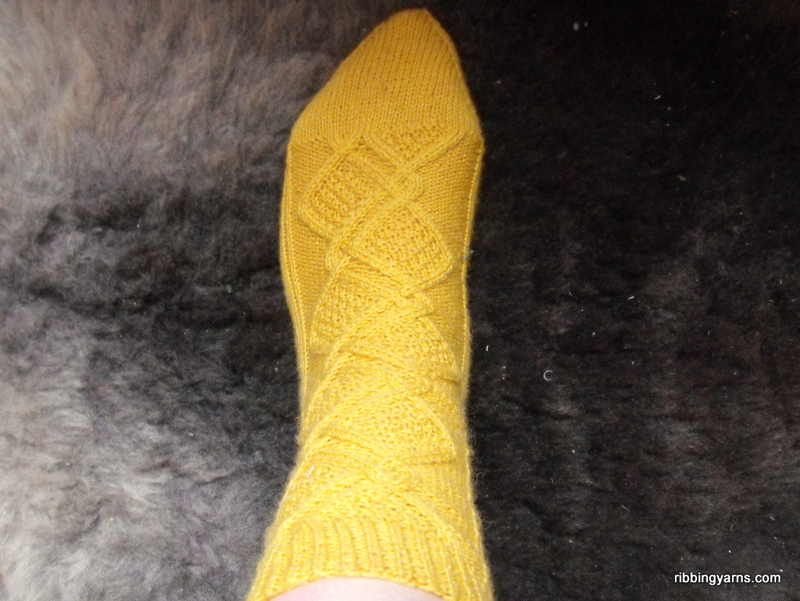 I finished sock 1 yesterday and I am now halfway down the leg of sock 2. I am thrilled that these crazy cables are emerging the right way round from my needles, and It’s also got me to learn an entirely new skill, namely cabling without a cable needle. I am trying it out for sock 2 now, and after a few hesitant rounds it’s becoming a much easier method. This whole process is teaching me that YouTube is very handy for demystifying tricky techniques. In other Sock Madness news, I met up with some fellow SM9 knitters at Syfestivalen in Malmø last weekend, and we all brought along our round 1 Alohomora socks! We had a great afternoon hanging out knitting and popping into the festival hall to ogle (and buy) pretty yarns, packets of tiny colourful beads, and beautiful fabrics. In between the first and second Sock Madness rounds, I continued with my Magpie Color Affection shawl, and this is what I was working on on Friday morning during the solar eclipse. We had an 85% coverage here in Copenhagen apparently. 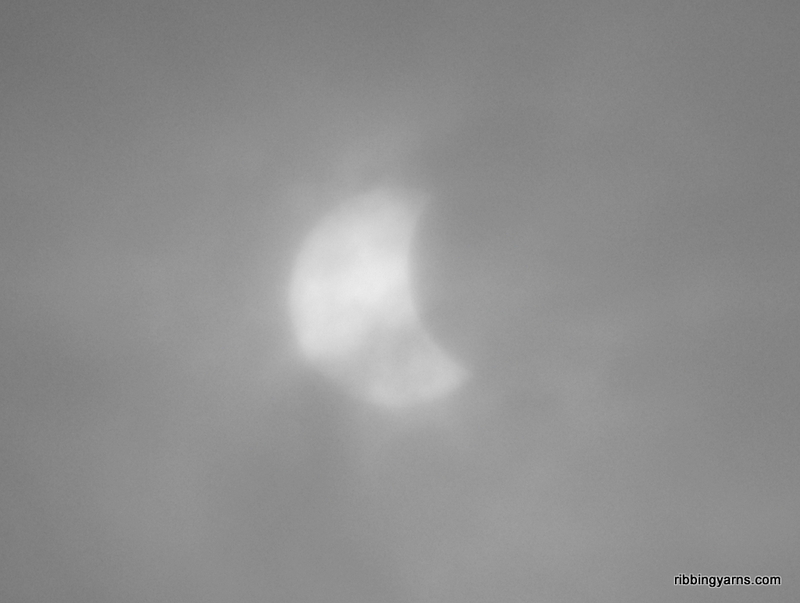 The morning was very grey and cloudy, but I was looking for a gap in the shifting clouds and caught a glimpse mid-way. The shawl is coming near to completion now- I’m on the edging and will pick it up again after these socks are done. I really love the texture of the fabric and the pattern created by the short row stripes, and am excited to see what it will look like after blocking. 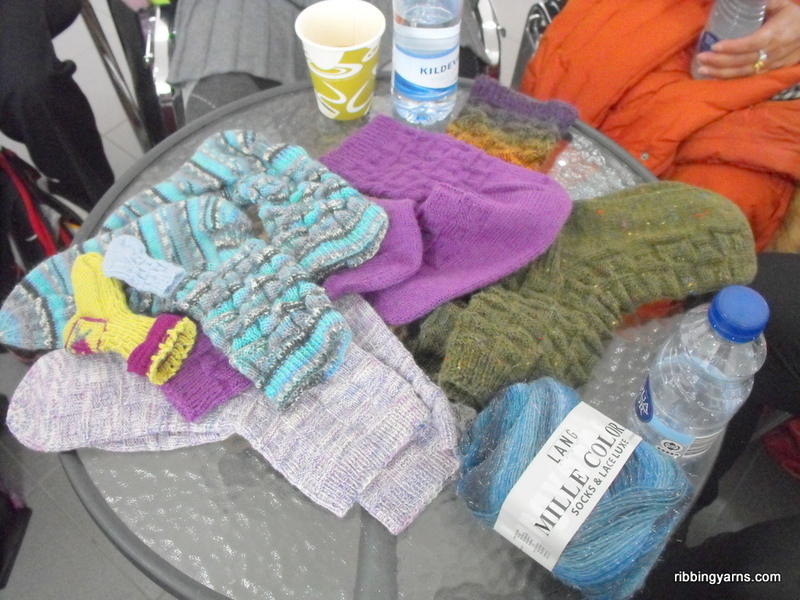 This entry was posted in Events, WIP Wednesday and tagged Alohomora Socks, Øresund Knitters, Cable Madness Socks, Cables without a cable needle, Color Affection, Knitting, Knitting Copenhagen, Knitting Techniques, SM9, Sock madness, Solar Eclipse 2015, Strik København, Syfestivalen, Team Stranded. Bookmark the permalink. 4 Responses to WIP Wednesday: Cable Madness! Great job and YAY for learning a new technique! Your Color Affection moved along quickly. Look forward to seeing a finished shot. Those cable socks looks stunning!